This is the book the Clintons do not want you to read… and a lot of other people do not want you to read, like the belligerent alt-right murder conspiracy peddles — individuals who need you to ignore the evidence in the White House. A groundbreaking and stunning investigation into the shocking and untimely death of Vincent Walker Foster Jr., the deputy counsel to the President of the United States—President Bill Clinton’s childhood friend and Hillary Clinton’s closest confidante. On July 20, 1993, Foster was found dead of an apparent self-inflicted gunshot wound in the head in Fort Marcy Park, McLean, Virginia. His passing was the highest ranking government official’s death since President John Kennedy was assassinated in Dallas, Texas, on November 22, 1963. Foster’s mysterious death sparked a firestorm of controversy that engulfed the nation. Was it murder or suicide? The charges leveled against Hillary and Bill Clinton were serious: Foster knew too much. They had killed him. Clinton staffers removed evidence from his office. Must be a cover-up. Investigators never found the fatal bullet. 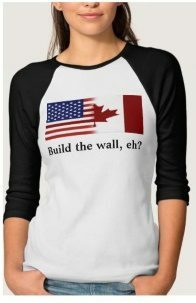 It’s a conspiracy. On and on it went. But who was right? Using new information exclusively obtained from the last person who officially saw Foster alive in the White House, and supported by the historical record documented in five official investigations that relied on the “available evidence,” investigative journalist Marinka Peschmann’s findings lead to a terrible conclusion and to possible a cover-up. 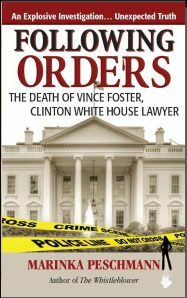 Get your copy of Following Orders: Death of Vince Foster, Clinton White House Lawyer (One Rock Ink Publishing). Following Orders: The Death of Vince Foster, Clinton White House is the sequel to: The Whistleblower: How the Clinton White House Stayed in Power to Reemerge in the Obama White House and on the World Stage. Update 2015: Roger Stone and Robert Morrow in their new book, The Clinton’s War on Women. also do not peddle debunked murder conspiracies as real “news,” and have independently confirmed my findings of what may have happened. That being said, I cannot speak to any of their other claims which are not in my books. It is instructive that murder conspiracy peddlers who claim they are bringing the real “news” in the alternative media, attack me, a woman, but do not attack Stone or Morrow. I had an advantage others before me did not have. I had the evidence of years of official investigations, as well as what fellow journalists had reported, to draw upon.